Back when I was a kid, Mad Magazine supplied me with an unexpected life lesson wrapped in a multi-panel cartoon. Here is what I remember -- a series of images depicting insincere conversations. In each frame, two people stand, holding masks up to the sides of their head. They face you, the audience; Their masks face each other. One conversation takes place through the masks. A completely different one takes place toward the audience. I don’t remember the actual conversations, but I do remember the the gist of them. The masked dialogues are cordial and caring. But the truth comes out through what is said toward the audience. It dawned on me that the masks were leading to a complete waste of time. What’s the use of having an insincere conversation with someone? I had a friend in college (let’s call him Ralph) who was lots of fun. Occasionally, while hanging out with each other, we would run into someone on his I can’t stand this person list. Often this would lead to numerous phone calls that Ralph would then ignore. “Why does this person keep bothering me?” Ralph would ask, clearly annoyed. I restrained from pulling up my mask when responding. Isn’t ignoring a requested call rude? And what’s so terrible about being attentive and polite during a conversation, but ending it with something like “It was good talking to you” or “Maybe we’ll run into each other again sometime”. Period. Misleading others is inconsiderate. Wasting someone’s time is insensitive. Taking a gift that could have instead gone to someone appreciative is thoughtless and selfish. Years later, Ralph thanked me for this conversation. Perhaps we need to put on a brave face. Maybe we are afraid that if a dear friend understood the sacrifices we were making they would stop accepting our help. For these and plenty of other reasons, there are times in which donning a mask is the right thing to do. But more often than not, a mask is an entirely unnecessary shield between ourselves and the outside world. It keeps others from knowing us, and it keeps us from knowing others. This sounds just about right to me. I believe that one has to put their mask down in order to discover and cultivate this kind of connection. For this reason, I kindly ask that you take off your mask. Know me and be known. These days with so many people trying to make money with their blogs with their "content" that's full of fluff and hit words, I found this blog to be a breath a fresh air. Like, that one paragraph when you said misleading others was inconsiderate pretty much summed up what I was feeling but couldn't put into words. I grew up in Hawaii where masks pretty much don't exist in relationships, but now I am going to college in Omaha Nebraska, and I was getting angry or confused after hanging out with some people, but I couldn't understand why. Now I have a little better understanding of the midwest culture. I gotta say, thanks for writing this, you've helped me out man. What a culture shock, huh? I hope you don't give up on "main landers" completely. Although I ran into many people masquerading behind masks during my college years, I also had the great luck of meeting people who either didn't have one or who could eventually be convinced to put theirs down. Thank you for sharing. Your words found me at just the right time. There's nothing better than learning that what you fear is self indulgent has actually helped someone, somehow. Good luck and thank you again. I also remember these masked dialogs in Mad Magazine and found this post while googling for a sample. I am working on a project where we are discussing "Emotional Intelligence" in project management, and thought this would be a great way to illustrate a functioning team versus a non-functioning team. 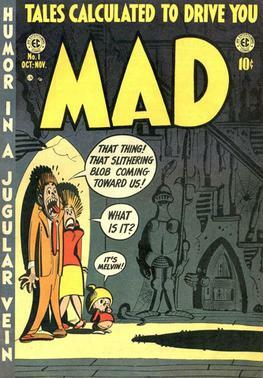 I think the rest of the people on my team have never seen a Mad Magazine as I'm in Quebec. I often see the mask on people in social situations and think back to Mad magazine. Good for you Elsa that you approached your friend because when I have seen behaviours like this in somoene I don't trust the friendship any longer.